Donatos recently provided pizza to these students at Washington Middle School as they celebrated “Pizza with the Principals.” This is in appreciation for their selection as Students of the Month for March. They are chosen by their teachers because of the outstanding example they set for their peers in such areas as academic effort, good work ethic, kindness to others, and service to their school. Pictured (L to R): Sofia Sisco, Ian Fleming, Connor Day, Jenika Bowling, Mr. Wayne, (Principal) Isaiah Smith, Saul Haynes, Jillian Frederick and Tadem Wright. 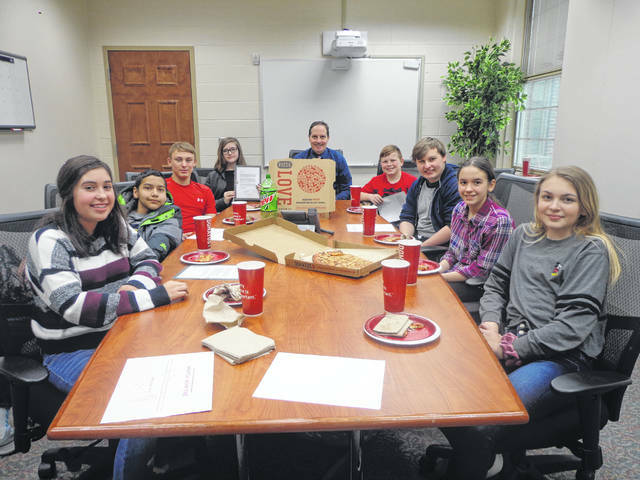 https://www.recordherald.com/wp-content/uploads/sites/27/2019/03/web1_March.jpgDonatos recently provided pizza to these students at Washington Middle School as they celebrated “Pizza with the Principals.” This is in appreciation for their selection as Students of the Month for March. They are chosen by their teachers because of the outstanding example they set for their peers in such areas as academic effort, good work ethic, kindness to others, and service to their school. Pictured (L to R): Sofia Sisco, Ian Fleming, Connor Day, Jenika Bowling, Mr. Wayne, (Principal) Isaiah Smith, Saul Haynes, Jillian Frederick and Tadem Wright.